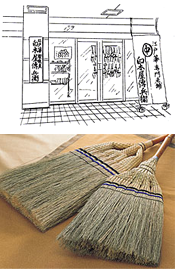 We have been making and selling Edo style brooms since 1830. The natural substances contained within the broom cypress (goose foot) give a sheen to the tatami mat surface that prevents abrasion and thus helps to extend the life of the mat. Of course our brooms may be used on conventional flooring as well to sweep up dirt without damaging the surface. In addition to our traditional products, we have recently modified the design of the Edo broom to make it lighter in weight and more efficient. And it goes without saying that the broom is an environment-friendly way to keep your house clean.